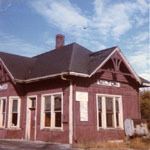 The Stewarttown Train Station in a state of dilapidation. The word "Stewarttown" can be madeout in the sign above the door. The signal lights for the station can be seen to the extreme left and the part of a track can be seen in the bottom left corner. Grand Trunk Railway Station, Brampton. Note the Brampton station is constructed of brick. The Grand Trunk Railway Station in Acton. The signal tower was later removed. The former Stewarttown flag station on the Hamilton and Northwestern Railway. It sat at the 6th line and 15 sideroad. In 1960 it was removed to Brigden's at Hornby. It is pictured here as a storage shed. See p457. Canadian National Railway Station on Bronte Street. Georgetown Train Station. Acrowded scene with horse carts loaded with milk jugs. Georgetown Railway Station from the north side of the tracks.